1. If you already have PDFs saved to your computer, you can easily add them to your Zotero library. First, locate the PDFs on your computer. Select the PDFs, then drag them into the center pane of a Zotero folder. 2. 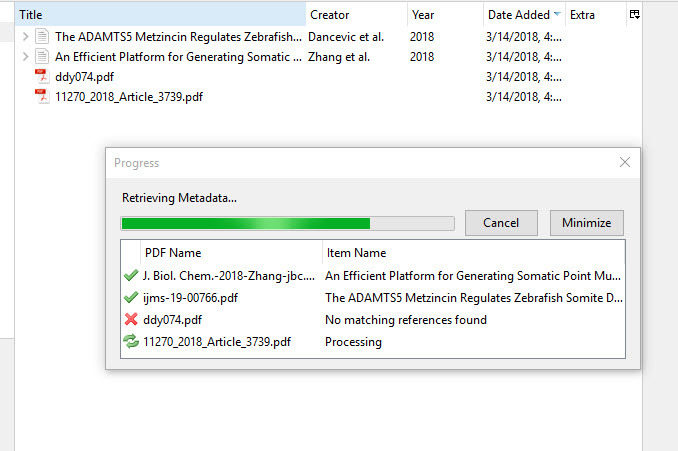 Zotero will automatically search the first few pages of a PDF to find the metadata (or citation information) for that PDF. 3. 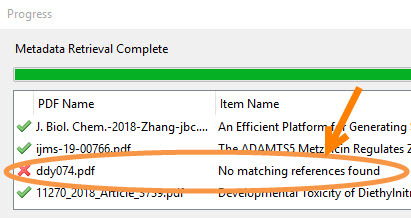 A parent entry with all of the metadata for the PDF is created, and the PDF is now a child file below the parent information. The PDF is also renamed with easily identifiable information including the first author's name and the year of publication. 4. Sometimes, as with the example PDFs shown below, Zotero can't find any information for the PDF. There are several reasons why this happens - the PDF may be too old, the PDF's publisher may not have included this behind-the-scenes metadata or they kept it hidden, or the PDF may have been scanned in such a way that this metadata was lost (i.e., without the OCR information). You can still manually add the citation information or do a database search for the citation yourself, then drag and drop the PDF onto that citation information to keep the PDF together with its citation information. 1. In addition, to adding PDFs from your computer or adding PDFs directly from a database search, you can also add PDFs from within your browser. Click the PDF icon that says "Save to Zotero." 2. The PDF, along with its metadata, will be saved to your Zotero library.